This LP is 100% analogue and comes with an original screen-printed front cover designed by the London based artist Lewis Heriz. 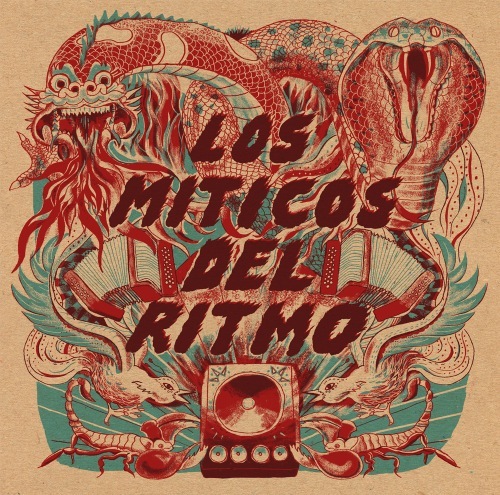 Assembled using vallenato and cumbia musicians living in Cali, Los Miticos del Ritmo are a 7 piece studio band put together by British musician, producer and now Colombian resident Will ‘Quantic’ Holland. Covers of Queen’s ‘Another One Bites The Dust’, Michael Jackson’s ‘Don’t Stop’ and Gildardo Montoya’s ‘Fabiola’ (as featured on Soundway’s ‘The Original Sound of Cumbia’ sit along side original cumbias on this feel good, house party cumbia LP. This might be THE BIGGEST CUMBIA RELEASE after Sancocho e’ Tigres.. In my personal opinion. And a serious contender for El paso del tamal as best cumbia.. so far.